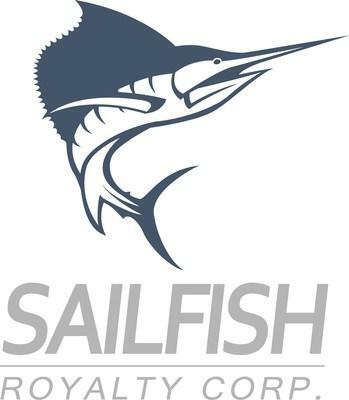 TORTOLA, British Virgin Islands , Nov. 9, 2018 /CNW/ - Sailfish Royalty Corp. (FISH.V) (the "Company" or "Sailfish") is pleased to report the closing of the previously announced restructuring (the "Stream Restructuring") of the Company's gold stream on the San Albino gold project ("San Albino") pursuant to a master agreement between the Company, Golden Reign Resources Inc. ("Golden Reign"), Marlin Gold Mining Ltd. ("Marlin"), Oro Gold de Mexico S.A. de C.V., Nicoz Resource S.A. ("Nicoz") and Gold Belt, S.A. ("Gold Belt") dated August 3, 2018 (the "Master Agreement"). Completion of the Stream Restructuring was conditional upon closing of the business combination transaction of Marlin and Golden Reign pursuant to a plan of arrangement under the Business Corporations Act ( British Columbia ), along with approval of the TSX Venture Exchange ("TSX-V") and the previously announced approval of disinterested shareholders of the Company. As of today, each of these closing conditions have been satisfied.